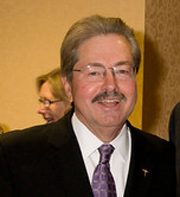 Former Governor Terry Branstad has resigned from his job as president of Des Moines University to pursue a “bigger calling” in 2010. Branstad plans to travel to all 99 Iowa counties to talk with Iowans about running for a fifth term as governor. During a news conference at Des Moines University, Branstad highlighted portions of his 16-year tenure as governor, saying that when he left office in January of 1999 the state had a $900 million surplus. Branstad is taking a plunge back into politics, but not without what he termed an “emotional” good-bye to Des Moines University. “This was a difficult decision because I love this place,” Branstad said. In fact, Branstad intends to be a frequent campus visitor, as he chose to retire from Des Moines University rather than resign for a reason. Nearly all of Branstad’s immediate family attended today’s private announcement to faculty and staff and the news conference which followed. His six-month-old granddaughter was there, but his other granddaughter opted out. Branstad’s returning to politics with the blessing of his wife, Chris, although he said she asked him why he had to run when there were already a handful of other Republicans running for governor. Branstad leaves tomorrow for Las Vegas to attend the American Institute of Certified Public Accountants convention, then he’ll return to “devote (his) full attention” to “exploring” a run for governor. Some modern-day critics in his own party have questioned Branstad’s conservative credentials, pointing to his budget record, the fact that he appointed some of the Iowa Supreme Court justices who paved the way for gay marriage in Iowa and pointing out he approved two increases in the state sales tax. Branstad laughed when a reporter asked him if he was “conservative enough” to win the G.O.P.’s 2010 nomination for governor. According to Branstad, “the whole picture” shows he was an effective governor who cut taxes and pursued a conservative agenda.